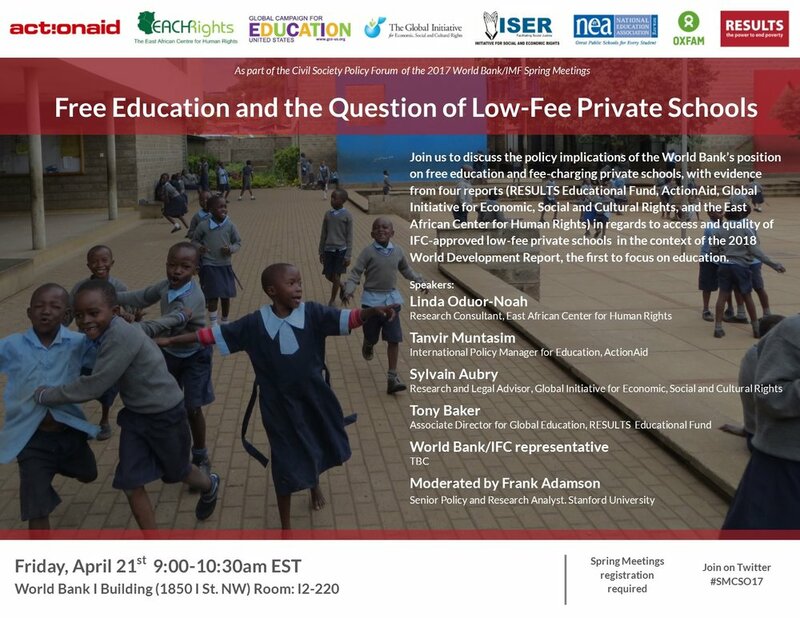 This session will generate discussion around the World Bank’s position on free education and fee-charging private schools and will present evidence from four reports (RESULTS Educational Fund, ActionAid, Global Initiative for Economic, Social, and Cultural Rights , and the East African Center for Human Rights), in regards to access and quality of International Financing Corporation (IFC) funded low-fee private schools. The session will highlight the importance of educational investments not deepening social inequalities to the detriment of the most marginalized populations. The discussion will be framed in the context of the WDR 2018, the first to focus on education, as a unique opportunity to shape World Bank’s policy orientations and programmatic implications regarding education equity.